Cardio Chisel - Max out on the clock while your entire body and mind grow stronger. If I said, do 8 reps and you can actually do 12 reps, I have limited your success. If I said do 8 reps and you can only do 4 reps right now, I have created an opportunity for you to feel badly about yourself. How does anyone know, other than you, how many reps you can complete? Here is the trick: Working with an interval, such as 30 seconds, allows YOU to be successful with what YOU can do in that time period. The interval allows for you to keep improving while keeping the group exercise class flexible for most levels of fitness. Exit class with your new appreciation for how mentally capable you are to do more than you ever believed you could or would do for yourself. The idea behind barre is to create heat within the body with small movements repeated numerous times. The "burn" felt in your muscles is when your muscles begin to change and are responding to the hard work that you are putting into your workout. Generally "Barre" class will include the obvious: a lot of "leg" work using the ballet bar, but additionally, it includes upper body work that is intense with 1-3 ibs weights. You will be shocked how quickly you will beg for mercy while using two pound weights to do ’T’ bicep pulls and pushes. Planks and push-ups are often a core component to barre class, along with various core work with the small ball. Your heart rate will tend to be slightly lower than other in classes unless it is a designated “cardio barre” class. The burn in your muscles will elicit a shake you have never experienced and again, leaving you in “awe” of how that could possible happen without a single weight used. It is recommended to be in bare feet or toe socks with grips on the bottom. Everyone loves a good butts & guts class. Mostly people seem to like "doing abs." Great! Let's "do abs," and butts the right way. Post Baby Core & Booty - I AM STRONG! Using my own daughter as a demo, I will be taking adults through a workout that includes your kids. Imagine a squat with your baby as added resistance? For toddlers, they can be right next to you on a mat of their own following along. For Pre-K kids, they can come with you as well and either participate or just bring something for them to do while YOU workout. Are you an athlete looking to improve your fitness for you sport of choice? I have competed in almost every sport that exists, including tennis, football, softball, running, and obstacle course racing. I can train you to improve your speed, agility, and mental toughness. Please see the special designated page for athletic training as a model of my athletic conditioning training. It's excellent to do this type of training in a group both for moral support to one another and cost efficiency. Get a total body strength and cardio workout with this sweet piece of equipment. 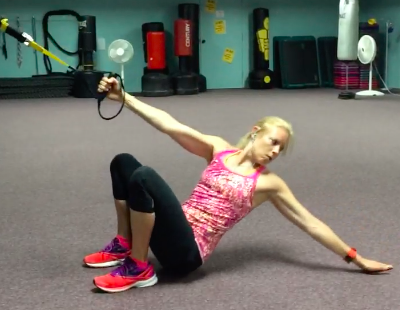 I love using the TRX bands with my clients who has "wrist issues," particularly when they do push-ups or planks. They are able to do an effective push-up using the TRX and it is by far one of the best core workouts you can do! A hybrid Class: 1) Low impact cardio that definitely gets your heart rate up 2) Effective "pilates" work, & 3) Quality strength training from "barre." The moves will help lengthen and strengthen your body as well as help you with recovery from previous workout beatings. Everyone loves a good circuit class, because it allows for a large variety of equipment and moves and the class flies by. Sometimes you will move about stations with a partner who can help motivate you to keep going and/or trade some colorful statements between one another about how mean SunshineKelly is to make you do deadlifts followed by burpees. Example Circuit - 1) Bicep curls on a TRX band 2) Push-ups on a bosu ball 3) Wall ball squats using a medicine ball 4) Burpees 5) Deadlifts with dumbbells. A “circuit” means that you complete each of these moves for an interval of time or a designated number of reps before moving on to the next move. You are in a group class room, but working at your own pace at the station (i.e. you aren't watching the instructor at the front of the room). As the instructor, I am free to move about the room to help participants individually, because I am not at the front of the class room demonstrating each move each time. The pace is fast and the class will fly by! A "Silver Sneakers," type of approach to this modality. The goal is to mimic activities of daily living such as getting out of bed, getting into the car, and getting into the bath tub. Strength training is important at any age and we certainly aren't shy about picking up a dumbbell to get it in. Post Pardum, Diastasis Reci, and "no time," were some of my challenges as a new mom. I've overcome the first two and time will always be the world's challenge. During my pregnancy, I exercised until the day of delivery. I competed in a 40 mile bike ride, and continued to teach my fitness classes. I can help you if this is where you are at in your health journey.